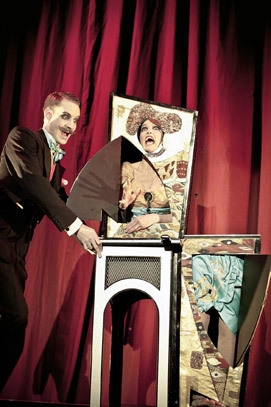 The unforgettable magician duo Amazing Norvil & Josephine is based in London and they present their work throughout the UK as corporate magicians at events of all types and sizes. If you are sourcing an act for a congress or corporate assembly, we will consider your unique event and suggest a version of the act that will be spectacular. This act is unique because, apart from incredible magic (and stage illusions, if your space allows), they also add a touch of something special to the act with entertaining demonstrations of acrobatics and singing. These corporate magicians keep standards high. Their award winning fun-filled act has received critical acclaim and is perfect if you're looking for a magician show to dazzle your guests at an upcoming event. The show is also ideal because of the act's flexibility to draw from their repertoire and custom craft you a corporate magician routine that will shine in your venue, and work around how much space you have or technical facilities that are to hand. for further information on how Amazing Norvil & Josephine could appear as your corporate entertainment to present something special that your audience and guests will talk about for years to come.